I live too far from my home town to have been much help during my mother and father’s aging issues and final illnesses. My sister Georgie has been the rock and center of the family, the guard dog if something threatens, the news gatherer and communicator, and the warm home we gather in when we are together to celebrate. She has put in countless hours and more energy than anyone has in order to be there for our parents. This piece honors her work on behalf of Mom. It depicts The Poet’s Garden, part of Highland Park in Rochester, NY. Mom and I both loved the Poet’s Garden. It is a wonderful woodland setting with poems carved in the benches and tall trees and lush green. When my husband and I took our summer trip to Rochester, we went to the garden to take photographs. It was raining, a soft misty summer rain. 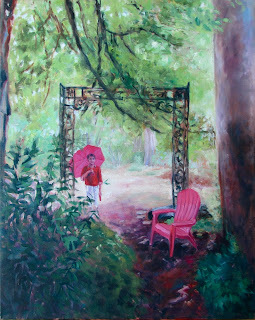 I was taken with this scene, where my sister held Mom’s pink umbrella under the wrought iron archway at the exit. Shelter here is represented at three levels: The shelter of the massive trees and the ironwork; the shelter of the umbrella, but mostly, the security that Mom had because she was sheltered by Georgie against anything that would harm her. Mom and I in Highland Park in the spring of 2008. This area is known for magnolias and is just outside the poet’s garden.